The color is much more subtle than it looks in the picture. It's a very light, very true gray. I pulled some other Martha Stewart colors together for the accent colors from the inspiration photo. I'm leaning toward the dark gray. Any thoughts? I found an old nightstand last fall for one side of the bed. I'm still on the hunt for another. I love the idea of this one giant star. A queen-size quilt is a big undertaking, but this is supposed to be a relatively quick sew, so I'm really looking forward to getting started after the first of the year. OK, so I've got all of the ideas gathered and most of the decisions made. Now I just need to make it happen. I'll update you on the progress as things move along. I'm just awful at the home decorating thing (I think) and probably more indecisive than you are Gwen! I can say that I just love your choices. Grey is such a good neutral too. It'll be fun to watch your progress on this project. What lovely color choices...it is hard to decide sometimes! FUN! I love the color palette you're considering. The quilt is going to be gorgeous. I looked EVERYWHERE for the perfect gray paint (6 different samples!) 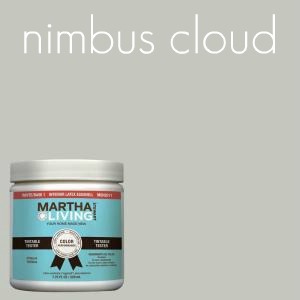 and finally bought NIMBUS CLOUD, 5 gallons of it, without ever trying a sample of it. I painted my whole living room and hallway, and I have LOTS left over to do the bathroom and who knows what else with it. You are right, it's the perfect shade of a true gray! I love everything you have picked out! That does look like the perfect shade of gray. I love it! 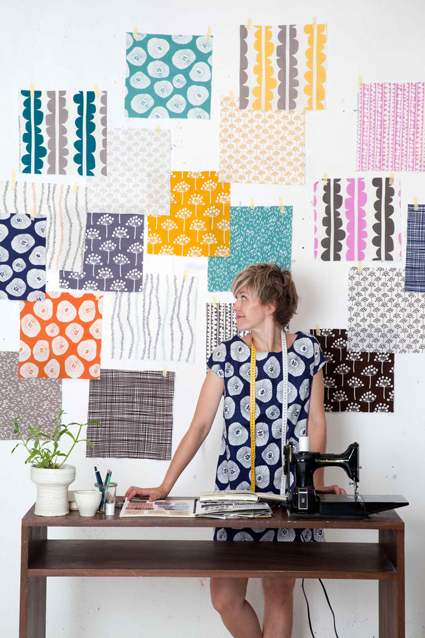 And I have to say although both fabric stacks are lovely, I am definitely partial to Echo- can't wait to get some of that. 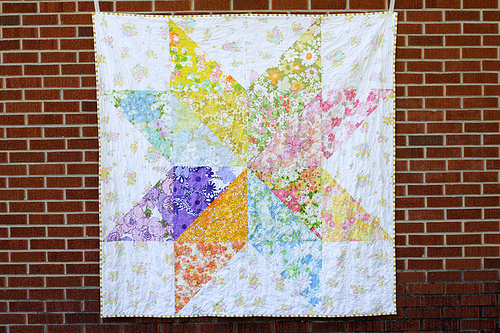 I would love to see a giant starflower quilt- beautiful! It would look amazing on your bed. :) Can't wait to see how it all unfolds. LOVE the grey!! That shade looks perfect and would look fantastic with the dark grey - In fact I know want to paint everything I own in that dark grey shade. There's something oddly comforting about it. I'm really loving the mustard/gray/navy combo right now! I love the dark gray nightstand against the light gray walls. 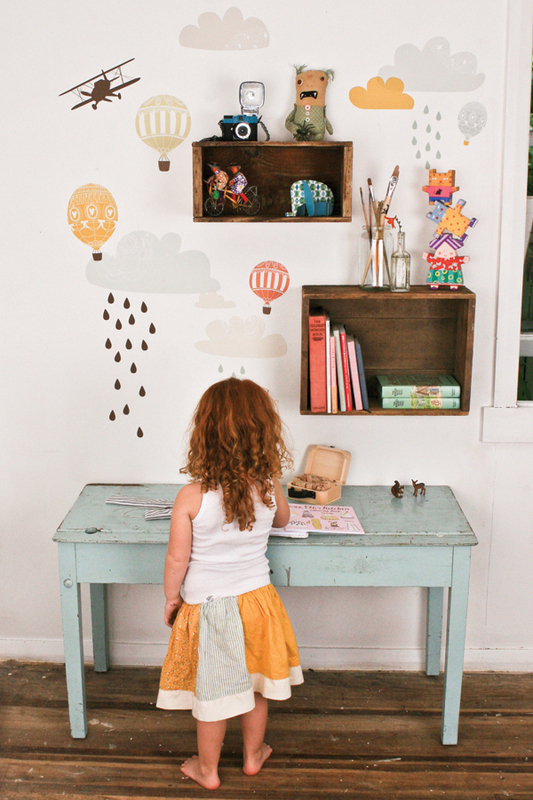 That's actually almost the same color I used for Riley's room, I think it's just a shade off. What about painting the nightstand dark gray and maybe the drawer fronts a light blue?? Hi Gwen..If you're a bit uncertain regarding colour combinations visit Maria Killam at Colour Me Happy..she is a colour expert and has lots to say about greys and different neutrals with colour. I love her website. Your choices look great..I would just say the grey looks fabulous with plenty of white around. I think I just had the exact same conversation with my husband about the different shades of gray. He didn't get it. I LOVE the colors you picked. Subtle and calm, like you said, but without being boring in the least. And I think that the dark gray nightstand would look great. Happy decorating!! Love the colours in the fabric bundle and the Echo ones are divine!!! I have made a couple of Giant Starflower quilts and they are nice and quick to put together - and huge!!! So that is not your room? I like that blue from the bedroom do you know the name? Ana - No, my room is not pictured here. If you are talking about the picture with the dark gray nightstand, the blue they used on the walls is Artesian Well by Martha Stewart for Home Depot.